Black graphical artifacts streaking across maps | Not a game bug, only affects AMD GPUs with June '18 or so drivers. See solutions below. (Solution #1) - We have been receiving reports from a user that this may have been fixed in the latest 18.12.2 AMD Adrenaline 2019 drivers. 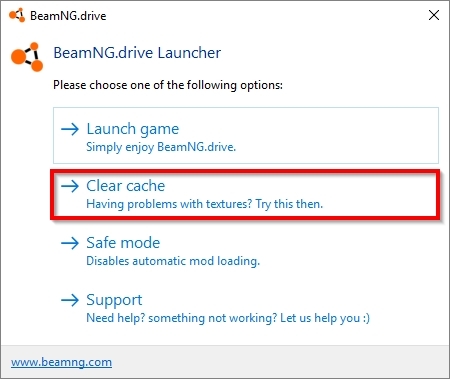 Please update your drivers, and press the 'CLEAR CACHE' button in the launcher to force the shaders to be regenerated. Let us know if this helped you! Bolide Track Toy could break the Bolide | Remove/Disable and wait for up to date version. Better Sounds Mod could break the game. | Remove and Clean Reinstall the game. Then wait for 0.15 compatible version. Parking Lights mod breaks the game | Remove/Disable and wait for 0.15 compatible version. 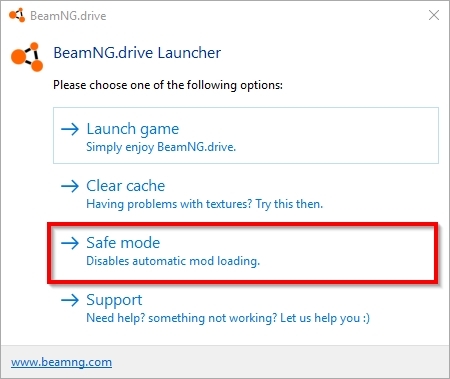 Any mod that modifies game's core files could potentially break the game | Remove these mods and wait for 0.15 compatible versions. Nice! Italy looks amazing can't wait to download it. You guys really knocked it out of the park with this one! Well that's a beautiful map along with a wonderful car to drive ! Game doesn't look freezed but I can't do anything. Thank you guys for your hard work to give us those for the vacations ! I under serious awing here, great mediterranean vibes all over. And my 660 ti is holding ! If you visit Italy remember to bring some jerrycans as they seems to be no gas stations whatsoever. Also do visit Italy because it might be the best map i've ever seen. Update looks so sweet and crafted with love and passion... Amazing, absolutely amazing! Can't wait! Light leaks through objects (static and other vehicles) when the light source is close to it. Italian car has some smooth shading issues where the rear lid is mirrored. The hubcap(s) on the Autobello have trouble falling off . To replicate this, I crashed head-on at roughly 80 km/h with 25% overlap. AMD Radeon (TM) R7 360 Series. I'm also running on the lowest settings. The camera being in the water never used to do that. how am i enable script AI? The Italy map is looking great! It was worth waiting for it. Piccolina looks awesome too! I really like the attention to detail. For example the moving tip of the exhaust in the baja version adds a lot! And the better optimization - something that everyone will appreciate. I like the Script AI tool as well, it adds many new possibilities. Great job devs! Thank you for the update! The red water is just a product of the low setting optimization, but it would be nice to have a less intense colour. The water in jungle rock becomes a light blue.